Members of Dominica’s Kalinago Tribe were last Monday [May 23], publicly applauded for their restorative work at the Nevisian Heritage Village. The four-member team spent three weeks on Nevis repairing huts at the Gingerland-based historical site. While on Nevis, the Kalinago men and woman made a courtesy call to the island’s Premier and Minister of Tourism, the Honourable Joseph Parry, and later, participated in a brief appreciation ceremony. Premier Parry, late last month at his office in Bath Plain, warmly welcomed the team to Nevis and commended the staff at the Ministry of Tourism for the initiative. “I am very pleased that Mr. O’Flaherty and the Ministry are able to bring you back to Nevis so that we can have the original huts of the Caribs and that it would be able to enhance our tourism because that is what we are trying to do: promote the development of tourism,” Premier Parry said to the Kalinago group. “We cannot only educate our people as to the contributions they made but we can [also] promote them as part of our tourism industry,” Mr. Parry added. “I would just like to add, from the Ministry’s standpoint, our sincerest thanks to the Caribs or Kalinago people from Dominica. “We hear a lot in history about the Caribs [and] the Arawaks, and here you have a living testimony as to how they actually lived and perhaps still live in certain parts of the region,” Mr. O’Flaherty said. 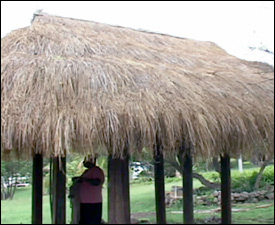 The Nevisian Heritage Village, as the tourism official highlighted, “will be a heck of a lot better” as a result of the restorative work that was executed by the Kalinago men and woman. In addition to thanking the group for its time, Mr. O’Flaherty invited the Dominicans to return to Nevis on a pleasure trip, assuring them that his Ministry and the Nevisian community, by extension, would administer unparalleled hospitality. The group was headed by Mr. Gerald Langley, who, at the appreciation ceremony, recorded his thanks to the Ministry of Tourism and other key partners for their hospitality. “We had a wonderful time for three weeks and we had, of course, a lot of hard work but all in all I can say it is a job well done. I would just like to say thank you very much to the workers who have been always willing to work and to continue the job,” Mr. Langley said. Culture and Tourism Official Mr. Prosper Parris, who also formed part of the Dominican team, also recorded his gratitude to Nevis’ Ministry of Tourism. “I represent part of the Kalinago people and tourism and I know how important that structure means to you but I just want [you] to continue and [I] really express our gratitude for your hospitality. “You not only mean work,” he added, “but you have taught us the culture, you have invited us to your homes and been very generous and shared everything you had with us and for that we are very grateful,” Mr. Parris said. In closing, Mr. Parris encouraged the Ministry of Tourism to continue to improve the site. Tour Guide at the Nevisian Heritage Village Ms. Patricia Thompson and employee within the Ministry of Tourism Ms. Sylvia Dore also expressed their gratitude to the Kalinago people. Ms. Thompson used the opportunity to invite citizens and residents of Nevis to visit the site. She also presented Mr. Langley with a token of appreciation on behalf of the Ministry of Tourism and the people of Nevis. “We have started to enhance the village already and we have plans to go further. “The village is here not only for the visitors but it is here for locals as well. I have experienced locals here who are taken aback because they said they stepped back in time because the artifacts that we have here speak to that and so this is our history. “Do not let the visitors come and enjoy what we have and we ourselves cannot enjoy it,” Ms. Thompson said. The Nevisian Heritage Village once housed a Sugar Plantation Cotton Ginnery. It is located at Fothergills Estate in the St. George Parish. « St. Kitts – Nevis Tourism Highlighted In Washington D.C.